What are the functions of my account? WWin account is a central place that gives You possibilities to use our offer. 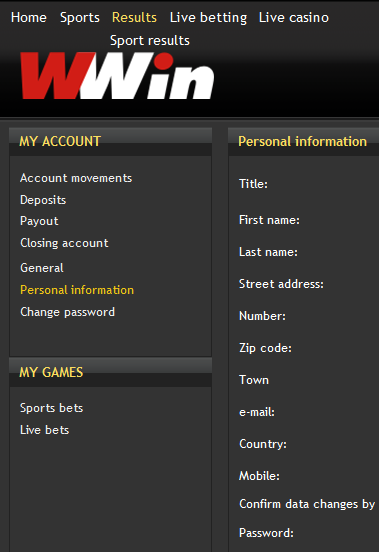 For example, when You are logged in, You can deposit or withdraw, bet stakes, etc. In the window “My account” there is a view of all Your stakes, and a balance chart of Your account. In the window “My account/General” You have a possibility to adjust Your personal settings for Your WWin account. My account has been blocked because of multiple wrong password entry. What can I do? Please contact our customer service support while providing Your first name, last name, address, date of birth and Your e-mail address stored on Your WWin account. Under “subject” write the reason of Your enquiry. After You log in You can change Your e-mail address in “My account / Personal Data”. You enter Your new e-mail address and Your password and click “Save” and Your new e-mail address is saved. After that an e-mail is sent to You old and new e-mail address with a notification that the e-mail address has been changed. If You have forgot or lost Your log in data, please contact our customer service support while providing Your first name, last name, address, date of birth and Your e-mail address stored on Your WWin account. Your e-mail address will be updated as soon as possible. After You log in You can change Your password in any moment in “My account / Change password”. You enter the old and new password and repeat the new password, click on “Save” and Your password is changed. We recommend You to choose a password containing of numbers, letters and capital letters and that You change the password in intervals. Unfortunately, that isn’t possible. Every username on the WWin webpage is given only once. As soon as You have successfully registered, You need to keep and use that account with the chosen username. I got married. How can I adjust my WWin account? Please contact our customer service support while providing Your first name, last name, address, date of birth and Your e-mail address stored on Your WWin account and that You send us a copy of marriage certificate by e-mail, mail or telefax. How can I close/block my WWin account? In account settings under “My account / Account termination” You can self-block Your account or send an e-mail to customer support with a request to block Your account. You can choose the period of time You want Your account to be blocked. It can be 1 week, 1 month, 3 months or undisclosed time (minimum 6 months). Pozor: User cannot cancel the self-blocking of the account before the deadline expires. After the deadline expires (1 week/1 month/ 3 months) account is automatically activated. Blocking the account on undisclosed time last for minimum 6 months, but the account isn’t automatically activated. Please ask all the remaining funds to be withdrawn from Your account. Further deposits on Your blocked WWin account will not be possible. You can still log in to Your account with Your username and password. If You want to permanently close the account, please contact our customer service support while providing Your first name, last name, address, date of birth and Your e-mail address stored on Your WWin account. Your personal data is not deleted in case of self block of Your account and not even in the case of permanently closing Your account. These data are stored for security reasons until the aging deadline has passed because they could be necessary in case of exercising, executing or defending of legal acts in front of the legal authorities or courts. After the expiry of the deadline user can request the deletion of the data. How can I unblock my WWin account after I have arbitrarily closed it? Self block cannot be canceled before the expiry of the deadline. After the deadline has expired (1 week / 1 month / 3 months) the account is automatically opened. Self block on undisclosed time lasts for minimum of 6 months, but the account is opened automatically.